To find an available date to rent the Community Center, please look at the public calendar and then call the Village Office to reserve the room. Once the room is reserved for your event, download the appropriate forms from the links above and submit them along with the deposit to the Village Office. 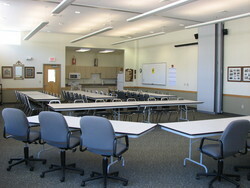 The Community Center Room is rented on a first come, first serve basis.